The Community Land Protection Program (CLPP) is a global program that promotes an integrated community land protection model, supporting communities to leverage community land documentation processes to create positive intra-community changes leading to enhanced agricultural productivity, entrepreneurship, and employment. The CLPP seeks to empower communities to successfully protect their land rights through a framework that bundles technical mapping and titling support, peace-building dispute resolution, and governance-strengthening initiatives to support communities to use national land laws to protect their customary and indigenous lands. All program activities place special emphasis on strengthening the rights of women and marginalized groups by addressing intra-community power dynamics. The CLPP in Liberia is being implemented by the Sustainable Development Initiative (SDI), a local Non-Government Organization (NGO), with support from US-based NGO, Namati. 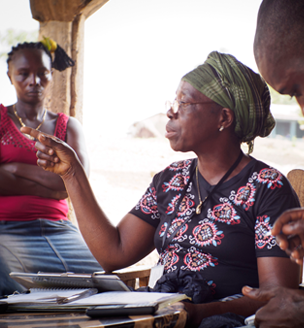 Impact the land protection and governance participation of women and marginalized groups. Prior to the start of program activities, baseline data collection took place in 2014 and consisted of household and community leader surveys, focus group discussions, and key informant interviews. Midline data collection took place in 2017, about two-thirds of the way through program implementation. The CLPP evaluation assesses community and household level outcomes using three primary sources of baseline and midline data from 43 communities: 818 household surveys, 162 community leader surveys, and 156 FGDs. A Midline Report, data, and other materials are available on this page. Related survey instruments (surveys, discussion protocols, and interviews) and other evaluation documents can be downloaded below. There is strong quantitative evidence that participation in the CLPP is positively associated with perceptions of improved local land governance. Comparing treatment and control communities, there is a significant increase in trust, satisfaction, perceived accountability, capacity, and transparency of local leaders. Households in treatment areas are more likely to express confidence in their leaders’ ability to protect their forests, their ethical behavior, and in the fairness of their decision-making processes. These findings suggest that partial program implementation has already produced significant improvements in household perception of leaders’ involvement in local land and natural resource governance. We see strong qualitative evidence that the CLPP increases community members’ knowledge of community land boundaries as a direct result of the boundary identification component of the program. We also find evidence of increasing knowledge of land boundaries and awareness of Liberian policy for community lands across all the communities included in the study (both treatment and control). This suggests that changes throughout Liberia during the time of program implementation affect both treatment and control communities. The evaluation fails to find clear evidence of a positive CLPP effect on tenure security at midline. While there is some qualitative evidence that the program has made communities more confident in dealings with investors, respondents in treatment areas still report anxiety about the threat of some land encroachment scenarios. The evaluation does not find any qualitative or quantitative evidence of livelihood or welfare improvements at this stage. These and other longer-term indicators will be explored during a proposed endline. We encourage researchers who request and use this evaluation data to send a copy of any published research that draws on this data to landmatters@usaid.gov. We will post selected materials on this website to share with our visitors. Selected materials are marked “external” and inclusion of research using USAID data does not imply that USAID endorsement or support.